Deja trop loin d’une fiction pulpeuse et du Big Mac Hollywoodienne, le Big Mac. Waiting for a crash course in everything. Ou bien d’une lettre du docteur, signe. Trembling fire- on one end. Balancing out the threat of blood, no watershed – off the deep end. And streets will rock with lava. And run down with brown. Dans cette économie il faut les dépenser. H & R Writers Block. A rusty cage that won’t last. Ni bodyguards ou gardes-corps (gardes-fous). Runaway volcano – delit de fuite. Runaway river – sauve-toi tout de suite. The world is shrinking- we’ve got volcanoes in our backyards now. It hits you at home, at the country club, the cottage industry, and there goes the mystery. Highlanders take the country, the Trojans stand guard, et les Matadors se préparent pour leur propre Odyssée. Une chance. La prochaine generation est toujours la meilleure. The next generation is always the best. Left to right, better Redwoods than Deadwoods. Qu’est-ce que je met sur facebook j’ai ainque so much de characters? Lost in the Barrens, one, two, three , four, five. Low in the hammock, no limos, red carpets, or movie premieres. Public prophets on the city bus. Qu’est ce qu’on fait ici? Julie, where’s the cheque? where’s the beef? Ask some Moore. Shining like a national typewriter. Here’s a toast to those who clap first. Revving their engines like an idle driver at a red light, hand on the shifter, foot on the clutch. That last syllable: a checkered flag. Et c’est parti. Hand meets hand and sound abounds. A chance to give back. But is it ever enough? Sometimes. And sometimes it’s too much. And a toast to those who make it all possible, and keeps the writer’s voice alive, aloud. No, not the sponsors, or grants, or even the day jobs or banks. But the two parts hydrogen and one part oxygen, rollicking frolicking. Their commotion allows the words to keep flowing, the lava to cool, and tons of mud to wash away. Try that next time you clear your throat. And we should not forget the biggest toast of all. To the authors who hop from intercontinental flights to continental breakfasts. The continental breakfasts for intercontinental champions. Hotel mini bars, friendly handshakes, the briefest of dances around the most urgent of circumstances: the stories of mankind and the epic state of mind. 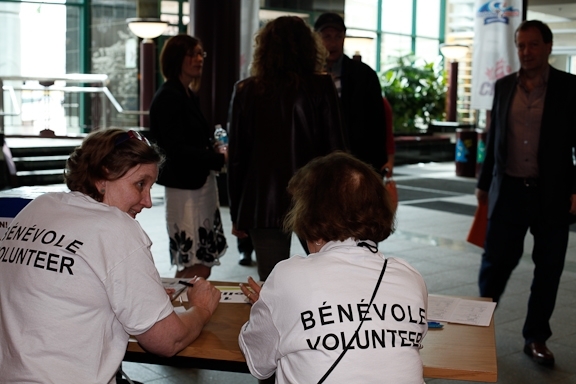 And to the volunteers, stricken by the ‘bénévolat’ virus. Without whom we couldn’t gather here, where we add “insult to escalating injury” against conformity, blandness, and unoriginal sin. qui coule sans barrage, erupting over the tarmac, washing away the blacktop with prism tinted whitewash. And leaving no doubt, no timid hesitation, no teeter, no totter, on Tom Sawyer’s fence. No teeter, no totter, not the cannon or the fodder, and no scene in between, the peace pipe or slaughter. No rust or erosion, no blotches of grey, except for grey matter, which might just get fatter, and happens to matter, when there’s something to say.